Sturdy as they come, this steel table can be used for just about any application requiring a strong, level platform. Ideal for holding heavy L-Block shields and caves, the surface is powder coated and the front legs feature adjustable levelers. 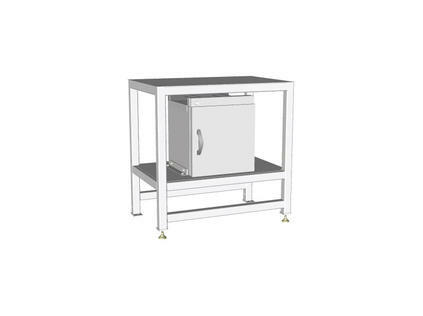 The middle shelf features a storage safe that is ideal for storing large quantities of high-energy radioisotopes and/or target decay. Shielded with a thickness of 2" of lead, the safe is encased in a powder-coated steel jacket and features an adjustable shelf. The lead-lined door is hung with heavy duty non-sagging hinges and is key-locked to prevent unauthorized access. 244-006 Lead Storage Safe, 2"